When the cinema is full you know it’s gonna be a good one. When the people in that cinema join you in laughing at all the right places, and come together in a collective applause as you leave, you go home, get on the blog and tell everyone about it immediately, even though you’ve got 6am PT the next morning. Edit, made it! MAMIL. Funny, warm, and moving. Relatable on so many levels. If you know, you know. Middle Aged Men in Lycra, for those not in the know, is a film written by Nickolas Bird and Eleanor Sharpe, and narrated by Tour de France commentator Phil Liggett, about what makes men turn to the bike at a certain age. Midlife crisis? Health scare? To support a friend fighting cancer? Or simply to stay alive. The film follows a few groups through their various love affairs with the wheels. The Fat Boys cycling club from Adelaide and their blossoming bromance that stretches far beyond the time spent actually out on the bikes. A christian cycling club and how they see their rides as a form of worship and way to connect with God. A man and his best friend, now free from cancer, who inspired him to ride to raise money for cancer. A high flying barrister who clung to cycling after a relationship breakdown and who has now lost a part of his soul to the bike and everything that comes with it, travelling the world to take on the toughest climbs in honour of his heroes. Or the journalist who took up cycling to combat MS.
FREEDOM – and joy in its purest form. A hark back to our childhoods, where we could jump on the wheels to go anywhere, and do anything we liked. FRIENDS – the communities we’re part of, in person and online. The people we ride with, our clubs, our groups, our friends – these are the people who keep us out there, even when we really don’t want to or when life gets tough. FITNESS – of course it brings us fitness, makes us push ourselves, achieve things we never thought possible. Climbing hills we’ve always dreamed of, riding distances we’ve heard others talk of. Getting faster, stronger, better with every revolution of the pedal. FUN – because, really, is there anything more enjoyable than riding your bike as fast or as far as you can, with your favourite people? Not really. One line that got a laugh was when one of the riders was mountain biking: “When you’re descending, go fast enough to kill yourself.” I can relate to that, and unfortunately learnt my lesson when I decided to throw myself off my bike and break my collarbone and wrist in 2016. It’s a lesson I’m still learning as I get throat punched by the new-found fear when I least expect it. They’re right, you know. There really is nothing like the feeling you get when you’re totally in flow on a bike. Like the runner’s high, only faster. This film isn’t so much about the actual bikes (although of course it does talk about how much they all spend on them and me and Chris got serious shed envy more than once). It’s about the mental health and wellbeing benefits that cycling brings to us all. Not just MAMILS. The underrepresented MAFILS(?) too? (PS. you might’ve seen my mug in a Huff Post article about this last week). One thing it did make me do though, was want to ride my bike! 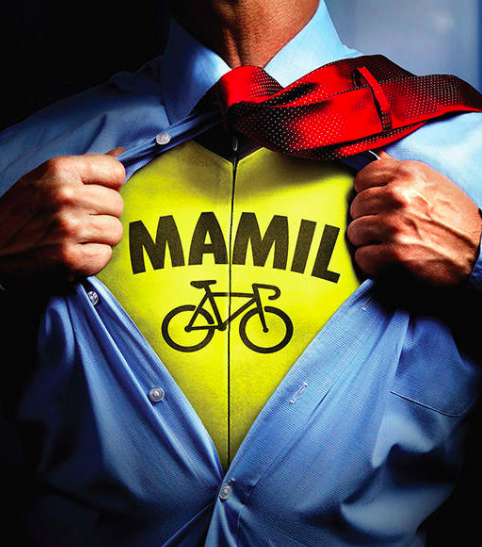 Find out more about MAMIL on the official website. And if you love cycling, I’d love you to subscribe to my YouTube channel as I’m making lots more vlogs in the coming months!